Natural England had concerns in a number of areas of the Lynx UK Trusts' proposal. Plans to carry out a trial reintroduction of Eurasian lynx in Northumberland have been rejected by Defra. The Lynx UK Trust submitted an application to introduce six Eurasian lynx to Kielder Forest earlier this year. But the application has been refused by environment secretary Michael Gove following advice from Natural England. In a letter to Dr Paul O’Donogue, the Trusts’ scientific advisor, he writes: ‘Following a thorough assessment, Natural England concluded that the application does not meet the necessary standards set out in the IUCN guidelines and fails to give confidence that the project could be completed in practical terms or that the outputs would meet the stated aims. Mr Gove adds that Natural England had concerns in a number of areas of the proposal, including that did not sufficiently evidence a securely held budget. He also said there were concerns about its reliance on volunteers and a lack of formal collaboration with other relevant organisations. Responding Dr O’Donogue told BBC News the Trust was "confident" it could fulfil Mr Gove’s reservations with a second application. "To put all this in context, there were several failed license applications for beavers before they were eventually reintroduced, so this is only the beginning of our journey," he said. 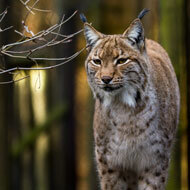 Lynx Trust UK first announced their plans to reintroduce lynx to the British countryside in 2015. Having been successfully re-introduced to Europe, the Trust was hopeful the move would control the UK’s deer population and, in turn, repair the forests they had damaged. But the plans were opposed by farmers, with many believing Lynx could attack livestock and could also pose a threat to humans. Welcoming Defra’s decision, National Sheep Association (NSA) chief executive Phil Stocker said: “NSA is delighted to hear the application has been rejected and that Mr Gove and his colleagues within Defra and Natural England have taken our comments on board. NFU senior countryside adviser Claire Robinson added: “The Government’s decision to reject the application from the Lynx UK Trust to reintroduce lynx into the Kielder Forest will come as an enormous relief to the farmers in the area."